Lumin brought Lampyri to the Town Hall, which was just a short flight away from the light shop. Lampyri stared up at it; the gears and the large clockwork machine running on the outside of it made the building look like a monument to technology. It wasn't unfitting, as the surface-dweller's city had no shortage of scientists and mechanics. The Buzzes entered the building through the stone doors sitting between two massive columns. The moment they walked inside, they were given a choice. There was another set of doors in front of them, but to their side was a staircase leading to the second floor. There was a sign next to the staircase that indicated that there was a library above them. Lumin –however- went through the doors, prompting Lampyri to follow him. The outside of the Town Hall was about as gray and earthy as any building in Moltara could expect to be. But the inside was much more polished with shiny floors and brighter colors. It wasn't gaudy like the palace back in the City of Lights, but it had the feel of a government building, nonetheless. "Just who are we seeing in here?" Lampyri asked, her words echoing in the quiet halls. "The leader of the surface-dwellers, or –more precisely- the head of their exploration team. I met him about four years ago when I was still the king and before The Engineer started becoming more active in the City of Lights. He's the one that helped me get on my feet when I took refuge in Central Cavern. As such, he knows about our predicament," Lumin answered, keeping his voice down as he spoke. Lumin led Lampyri into an office that was packed with bookshelves and filing cabinets. There were several blueprints and schematics lining the walls, depicting all sorts of machinery. Sitting at the desk in the middle of the office was a middle-aged strawberry Grarrl who had quite a bit of concentration invested in one such blueprint. 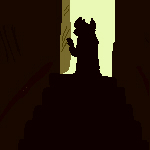 Eventually, the Grarrl noticed the white Buzz standing by his door and exclaimed, "Ah, Lumin! Come in, come in!" As the Grarrl stood up and walked around his desk, he also took notice of Lampyri. "Oh? I don't believe we've met?" Lumin stepped out of Lampyri's path so she could get a straight look at the Grarrl. Lumin then gestured to him and said, "Lampyri, this is Professor Frazer. Professor, Lampyri was one of my Royal Guards back in the City of Lights." "I see," Frazer said, adjusting the glasses that sat on the top of his snout and looked far too small for him. He then held his hand out to Lampyri. "It's good to meet you." Lampyri felt herself grow a little nervous, remembering what happened the last time she tried to shake someone's hand. This time, she didn't extend hers out in the first place and hoped that her explanation would do a sufficient job of keeping Frazer from becoming offended. "I'm sorry, I don't feel comfortable shaking hands. It truly is a pleasure to meet you, though," Lampyri said to Frazer so quickly that it felt more stiff than Lampyri had intended. Luckily, Frazer didn't appear to be bothered by it. "Very well, then," he replied, withdrawing his head and electing to bow his head slightly to Lampyri instead. Frazer told the two Buzzes to sit down. Once they did, Lumin told Frazer about their mission to retrieve some Fireflies from the City of Lights. "I wanted to talk to you about this because it would be easier to have houses ready for them when they arrive and that you would be able to help. I hope we're not troubling you with this." "Not at all!" Frazer responded, shrugging off Lumin's concern over putting a burden on the Grarrl. "Anyone is welcome in this city at any time. I'll be the first to admit that myself and the rest of the exploration team barged in on this land without much warning. We've been lucky to have found enough empty space in this cavern to settle into and neighbors that have been more than hospitable to us. I cannot -in good conscience- refuse to show the same to the Moltarans that want to move here." Frazer browsed his bookshelves before pulling out a scroll. He unrolled it on his desk and invited Lumin and Lampyri for a look. "This map shows the buildings we currently have open for residency." Lumin searched it over before pointing out, "There doesn't appear to be much in that regard." Frazer nodded and explained, "You'll find that in this city, new residents are more apt to build their own settlements wherever there is space in the outskirts instead of living in the deeper parts. In other words, the size of this city is largely owed to Moltarans building on to it." Frazer glanced at the map again and asked, "How many of your people do you plan bringing here?" Lumin and Lampyri looked at each other. Lampyri answered, "We probably won't want to take more than a dozen at once, as a larger group would attract attention. But we don't want this to be our only trip and –if things work out- we hope to bring more in the future." The Grarrl thought that over as his eyes keenly evaluated what the map showed him. "There should be enough to accommodate a small group like that. But if you want to bring more here, we might have to start construction projects to build new homes to house them in." Frazer's last sentence appeared to give Lumin some reservations as he stated, "If at all possible, I would rather the Fireflies not be placed in close vicinity to each other. The reason I say that is that in the event that The Engineer tries to search for them, she'd have less success if they were spread out across the city." "That would probably be wise," Frazer agreed with Lumin. He then sighed, "It's such a shame to hear about Neopets using magic to harm others like that. There's just so much potential for destruction when it's placed in the wrong hands." Lampyri grew interested in what Frazer had just said. "Are you a magician?" "Me? Goodness, no. I have no magical abilities of my own and I'm afraid I don't possess sufficient knowledge about magic to help you against The Engineer," Frazer replied. Lampyri was disappointed in his answer, but she decided to press him even more. "I saw that there was a library upstairs. Is there anything there that could tell us how to counter her magic?" Frazer tightened his lips and began to tug on the ruffled collar of the shirt under his red jacket. "We used to have magical texts, but... not anymore; we haven't for a long time," Frazer told Lampyri with reluctance. "It's... quite a long story." A story that Lampyri didn't have time to hear. She moved past that idea and went to the next one. "How about maps? Do you have any good maps of Moltara?" That was something Frazer could help her with, as he knew exactly where to find what she was looking for. He grabbed a set of maps from the bookshelf and unfolded them in front of Lampyri. The maps showed the various layers of Moltara and the caves and tunnels within them; some showed a view from above while others looked as if someone had made a slice in the crust. Frazer said that they were the best maps of Moltara he had, but there were still many noticeable gaps in them. "From what I've been told, extensive maps of Moltara are quite hard to come by. Fortunately, the Moltarans in the area have donated their knowledge to build something more complete. But even so, the farther from Central Cavern you get –whether it's towards the surface or towards the core- the less information we have on it." The City of Lights was one of the closest caves to the surface, so there was definitely a lot of blank areas on the map between there and Central Cavern. Lampyri reached for the maps that had just enough information on the upper section of Moltara to be helpful and asked Frazer if she could borrow them. When he said that she could, she stood up and said to Lumin, "In that case, I want to scout out our path to the City of Lights beforehand. If you and the Professor work on what to do once the Fireflies are in Central Cavern, I'll work on figuring out how to get them here." Lampyri's voice faltered a little as she added, "And... And while I'm at it, I'm going to try to find information on The Engineer. Hopefully I'll learn something that can end this permanently." Lumin was willing to go with Lampyri's idea. "Be careful," he told her before she left the room. "I'll be back as soon as I can," Lampyri promised. She then left the office and quickly flew back to the light shop to gather what she needed to take with her. With every intention of keeping her word, Lampyri exited Central Cavern as fast as she could so that she could come back sooner. "Forgive me if I'm being intrusive..."
Lumin lifted his head to Frazer, who appeared to be deep in thought. He was usually like that, but it was more obvious after Lampyri left. "Your friend appears to have gone through a lot, hasn't she?" Frazer continued after a pause. "At least, that's the impression I got after she refused to shake my hand." Lumin sighed, "She's told me some of what happened to her back in the City of Lights, but I don't think she would appreciate me telling others about it." Frazer easily understood and didn't ask Lumin for more information. Instead, he turned so that his side was facing Lumin and stared at the bookshelf. His eyes belonged to someone that was bringing up many memories within his mind. "Several years ago I had a student. He was very bright, but he had a problem with trust. I could tell that he had been betrayed and hurt many times over. 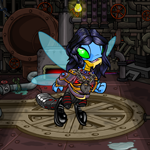 Myself and a couple other leading members of the exploration team did everything we could to give him a reason to trust other Neopets again and open himself up to others." Frazer grew quiet. The long silence prompted Lumin to ask, "Did he?" The strawberry Grarrl continued to gaze at the bookshelf. His eyebrows slanted as sadness began to come over his face. "No... I don't think we did enough for him," Frazer muttered in a tone that was filled with sorrow and regret. Lumin reflected on what Frazer had related to him. He remembered everything that Lampyri said when she snapped while trying to tell him what happened to the Fireflies. After running her words in his mind again, Lumin shook his head and said, "I don't think the problem is that she has trouble trusting others..."
The more Lumin thought about it, the curious he became. "...It's more like she thinks that she can't be trusted." The citizens of the City of Lights were very reluctant to talk about The Engineer when asked. Lampyri quickly found out that the same was true all across Moltara. She began her interrogations very simply. "Have you heard about The Engineer?" No matter who it was that she asked, they would suddenly start fidgeting around with a dreadful look in their eyes. They would quickly take a look at who was in the vicinity before mumbling under their breath that they had. Then Lampyri's questions got more specific. "Has she attacked anyone here? Has anyone tried to fight back against her? Did they find any weaknesses?" That was when the Neopets that Lampyri talked to tried to break up the conversation. If Lampyri was lucky, they would tell her that no one has been able to lay a finger on The Engineer. But more frequently, they would back away from Lampyri and stammer that talking about The Engineer was a bad omen before getting as far away from her as possible. Every now and then, Lampyri would manage to catch up with them just long enough to ask one more question, "Have you seen a glowing Buzz around here recently?" But that too was a subject that Lampyri had no success in retrieving information about. "No one has seen a glowing Buzz for a couple years now," they would all reply. Lampyri checked her map. She stood in a cave that wasn't too much farther from the City of Lights, but there was still a lot of ground to cover. The village she was in was small and the kind that information could spread through in no time at all; if one Neopet knew about The Engineer, then it was likely that they all did. But Lampyri hesitated to ask any of them, considering her previous failure at divulging information. She thought that it would be better to just jot down the village's location on a separate map that she sketched out and then head to the next one. Lampyri needed to be careful about the route she and Lumin would be taking. The City of Lights had been at peace with other cities and villages ever since Lumin took the throne, but there were still plenty of places that wouldn't react well to having Fireflies passing through. All of a sudden, Lampyri was stopped in her tracks by a red Korbat zipping past her. From what Lampyri could tell just from the glimpse she got of him, the Korbat was small and young. He was also extremely frightened. The Korbat flapped his little wings as hard as he could and his breathing was just as rapid. The Korbat took constant looks over his shoulders as he flew. But one time he took far longer to take a glance than he should have. He turned his head back to what was in front of him. The Korbat shrieked in terror and instantly fell to the ground at what he saw appear out of nowhere. Or rather whom he saw. The cave fell silent, so much so that a brief, quiet laugh could be heard. The laugh was followed by a comment that was not just targeted at the Korbat. "When will they ever learn that it's no use to flee?"